Navona Records’ NOTTURNO: The Complete Nocturnes and Ballades of Chopin is a fresh look at some of the Polish composer’s most expressive works. 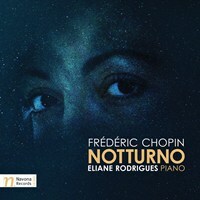 The nocturnes and ballades are also some of Chopin’s most innovative works, displaying exciting advancements in harmony, rhythm, and form—all renewed in pianist Eliane Rodrigues’s nuanced, thoughtful performances, recorded in Sacilie, Italy’s acoustically advanced Fazioli Concert Hall. Although he didn’t invent the piano nocturne, Chopin popularized it and certainly improved it beyond a mere character piece. He was heavily influenced by the sensuous melodies of bel canto opera arias, and developed a freer sense of rhythm and expression—as a result, the nocturnes exude an abstract mood or atmosphere. Chopin did, however, invent the piano ballade—a genre with its own distinct forms and qualities. His four ballades most directly contrast the nocturnes in their abstract narrative style—very different from “mood” pieces, they were likely inspired by poems by Adam Mick iewicz.Taking a page from Chopin’s own unwritten ballade narratives, Rodrigues includes text by Jantien Brys to accompany each nocturne, each one telling a sort of story without sacrificing the essential atmospheric nature of the nocturne. She writes, “For me, the Nocturnes are like a diary of Chopin, so Jantien wrote the texts as if they were excerpts from a fictional diary of his.” Rodrigues’s performances, influenced by these new texts, bring the listener a new kind of emotional connection to Chopin and music. HIGHLIGHTS Eliane Rodrigues was born in Rio de Janeiro, where she began composing at three, played her first recital at five, and performed with an orchestra at six. From there, she won prizes at age 18 at the Van Cliburn Competition in the United States and was a laureate at the 1983 Queen Elisabeth Competition. Rodrigues has a truly international performing presence. She has performed in Antwerp, Brussels, The Hague, Moscow, New York, Rio de Janeiro, St. Petersburg, Volgograd, Zurich, and elsewhere. In 1998, she was the leading artist at the Música Romântica music festival in Switzerland, featured as performer, conductor, and composer. Rodrigues makes her home in the Netherlands, where, in Rotterdam, she gives an annual Chopin recital at De Doelen on the day after Christmas. She is currently professor at the Royal Conservatoire of Antwerp, where she has taught for many years. Rodrigues has produced over 25 CDs featuring live and studio recordings. These include recordings of Prokofiev’s five piano concertos and several Beethoven works, including recent recordings of all of his piano concertos in St. Petersburg. 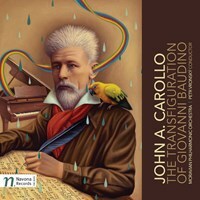 If you like NOTTURNO, please tell your friends! You can easily share this page directly on Facebook, Twitter and via e-mail below.